A couple of months ago, I reviewed a book called Cooper and Me and the Winter Adventure. 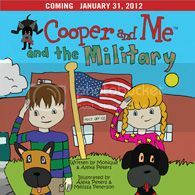 My kids really enjoyed that, so when Cooper and Me and the Military by Monique and Alexa Peters was offered, I jumped at the chance. Especially because -- while my kids don't have to worry about their parents being deployed, living in the Colorado Springs area, that is a situation many of their friends have or will face. This book is cute, and great for young children. The discussion of military deployment is done in a way that is appropriate for littles, and the illustrations are adorable. I really appreciated the "form letter" at the back of the book to give children a way to write a letter to a soldier, along with ideas as to how to go about doing that. I know my kids freeze up when faced with a big empty page, so just getting a start would make all the difference in the world. I think this book would be perfect for a child whose friend's parent is being deployed, as it would be a great way to talk about what is going on. I'm sure it would be great for the children who have parents leaving too! And I have one to give away! Lauren doesn't remember her dad's last deployment, and I don't know that she understands exactly what we're talking about when we say "so-and-so" deployed. I also have a lot of military friends that I could loan this book to. What would I do with it? It's a book. I'd read it :P Ok seriously, I would read it to my daughter and show her pictures of her dad when he was in the military. Dad is a civilian now but the military is still a big part of our life.